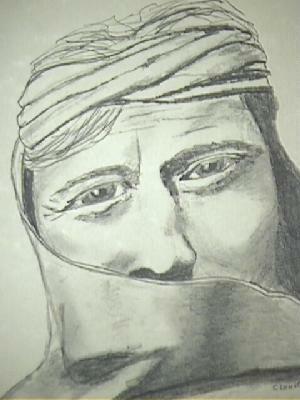 John Kostura - Sketch Art "The Seer"
This sketch is drawn around the "eyes" of the Seer. The intensity and concentration in his eyes only reveals part of the mystery he and only he is privilege to. Does he tell all that he sees? The hidden part of his face says no. "The Seer" is a youthful rendition of a photograph by Edward S. Curtis entitled "Waìhusiwa, A Zuñi Kyáqimâssi". 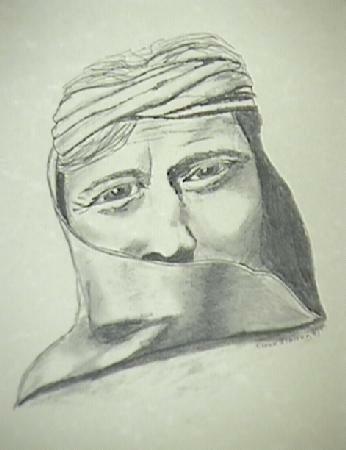 Curtis wrote "Kyáqimâssi ("house chief") is the title of the Shíwanni of the north, the most important of all Zuñi priests, Waíhusiwa in his youth spent the summer and fall of 1866 in the East with Frank Hamilton Cushing, and was the narrator of much of the lore published in Cushing's Zuñi Folk Tales. A highly spiritual man, he is one of the most steadfast of the Zuñi priests in upholding the traditions of the native religion." Personal Check or Money Order. All Original Art - Copyright © by John Kostura - All Rights Reserved. Web Page & Graphics - Copyright © C K Marketing - All Rights Reserved.